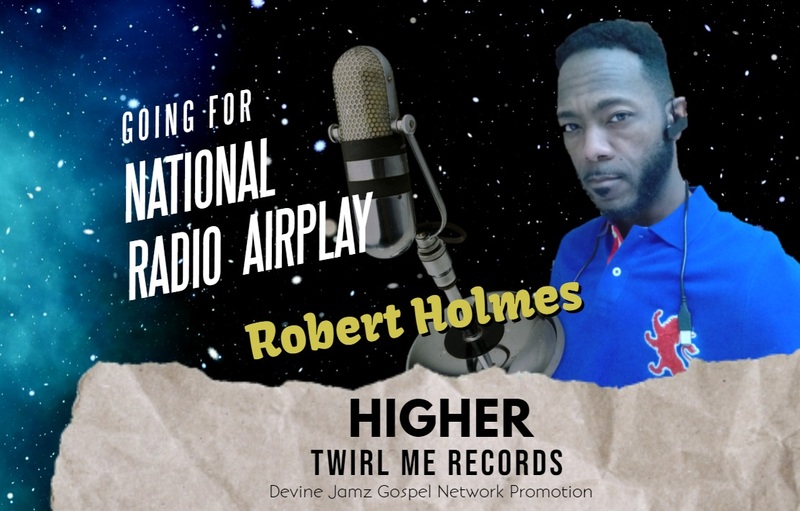 Singer – Songwriter Robert Holmes received the National Radio Airplay campaign with his song titled “Higher”. For some, the track might make you think of Jackie Wilson 1967 song “(Your Love Keeps Lifting Me) Higher and Higher” where Jackie sang about a woman’s love. However, Robert does not refer to a woman that keeps lifting him higher and higher in this project. No, Robert speak of the creator of Love; the one who paid a ransom for all of our lives. It’s all about our Lord and Savior Jesus Christ! 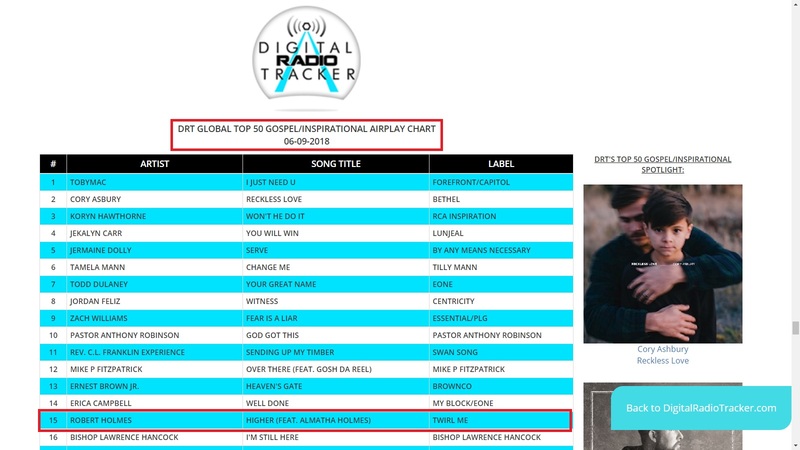 After completing a national radio airplay campaign, “Higher” was placed at #16 on DRT GLOBAL TOP 50 GOSPEL / INSPIRATIONAL AIRPLAY CHART the week of (6-9-18). 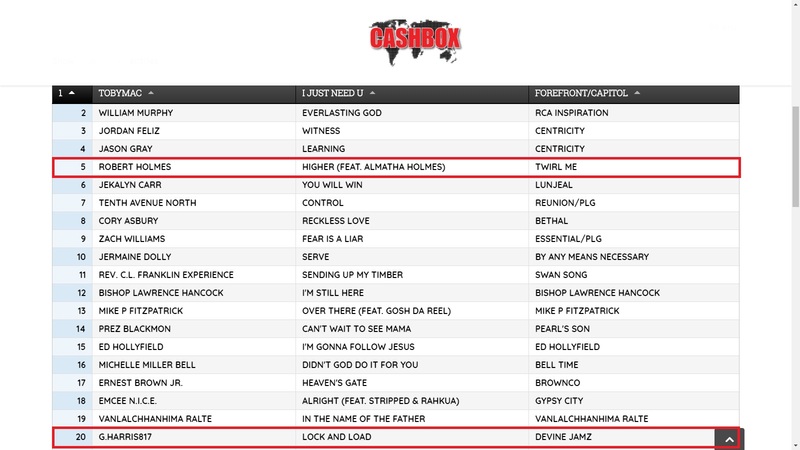 Robert is also 1 of 3 of our recording artists published by Cashbox Magazine (https://bit.ly/2JUK15g), a prominent competitor of Billboard and placed at #5 on the Gospel Chart the week of (5-24-18). Til this day, Robert continues to put in work for the sake of the Gospel! The signs of God taking him higher and higher is evident and proven! Robert Holmes is an American gospel singer, songwriter, deacon and entrepreneur. He is best known for his Twirl Me brand. He began writing and recording in 2015. One of his most popular tracks is “Make It Right” where he won an award for best gospel indie artist presented by The Akademia. When Robert wrote “Higher” he wanted it to have a feel-good vibe that everyone could relate to. Love is such a power thing according to Robert. It causes people to put others before themselves. Robert grew up in a family surrounded by love, so this wasn’t foreign to him. “Even when we don’t deserve a second chance or opportunities it’s because of love that we still obtain certain things in this life” – Robert Holmes.